Grand Illumination of Central Park: December 5, 2015, 5:30 PM. Lights are a huge part of holiday decorations, and this Grand Illumination will take place just behind our inn. So, once you’ve finished your Holiday Home Tour, you’ll make it back just in time to enjoy the lights! Chowder Cook Off: December 13, 2015, 5:00 PM – 9:00 PM Watch local restaurants and local fire departments battle it off at this year’s Oyster Farm Seafood Eatery’s Chowder Cook Off! Plus you’ll get to enjoy live music from Heather and Nathan Travis during the event. 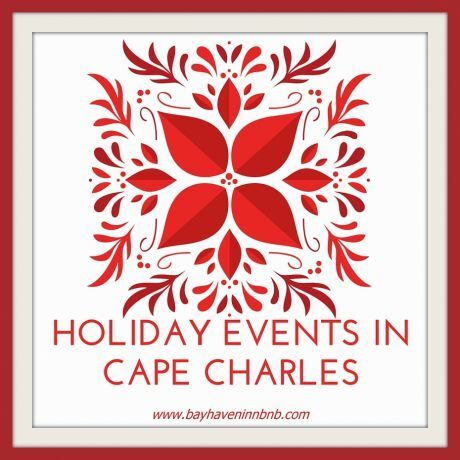 Happy Holiday Season from Bay Haven Inn of Cape Charles!